The release of Michael J. Behe’s newest book, Darwin Devolves: The New Science About DNA That Challenges Evolution, is nearly upon us and so the first chapter was made publicly available to entice readers. In this chapter, Behe outlines his main thesis: at the molecular level, adaptive changes are largely due to events that in some way destroy or damage proteins and enzymes. He calls it the first rule of adaptive evolution and to illustrate his point, he discusses the evolution of polar bears and describes the molecular events in that evolution as nothing more than a series of damaging mutations that result in a more adapted organism. But first, a quick introduction to Behe for those who may not know who Behe is or where this is coming from. With the release of his first book, Darwin’s Black Box, in 1996, Behe helped revolutionize and reorganize the resistance to modern evolution under the banner known as “Intelligent Design,” often abbreviated as ID. Many consider ID as simply creationism by another name, but the ID community works hard to distance themselves from that label. They insist that ID is a scientific theory, not a religious one, based on what they consider evidence that cells and organisms were designed intentionally, rather than the result of the aimless and unguided forces of evolution. Scientists and federal courts disagree, but this has not stopped the steamroller of pseudoscientific claims from the ID community. Fast forward to 2019 and Behe is at it again. In Darwin Devolves, Behe makes the argument that natural selection, which he prefers to call “Darwinism,” is driven largely, even exclusively, by mutations that degrade or destroy protein function. At the outset, it must be said that we have known for many decades that, occasionally, harming or even destroying a gene or protein can actually be good for the organism. What Behe is saying is that harming genes is the only way that unguided mutations can ever help an organism. That’s just not the case, but I’ll get to that later. Back to the polar bears. Behe offers them as an example of how harming genes can help an organism and lead to adaptive evolution. Imagine an ancestor bear population that looked pretty much like brown bears. Then came some random mutations that reduced the production or deposition of pigment into the fur of the bears. This made the bears white and - voilà! - the bears acquired natural camouflage in snowy climates so as to better sneak up on their prey. This seems like a pretty straightforward example and most people will simply take it at face value. Behe jumps from this example to his claim that this is all that unguided mutations can do. However, even in this apparently “pro-Darwinism” example, Behe exaggerates his claims and misrepresents what science has actually revealed. The evolution of polar bears was not only a matter of harmful mutations. The key reference here is a 2014 paper in Cell. In this study, researchers did genome sequencing of 89 polar bears and brown bears and discovered the molecular changes that distinguish these very closely related species, using the giant panda as the reference sample. The results were fascinating. For example, the analysis revealed that polar bears and brown bears have been separate populations with limited gene flow for less than 500,000 years. In the polar bears, the researchers found over a dozen protein-coding genes that had experienced recent positive selection, meaning that evolutionary forces had strongly favored specific variants. Brown bears, on the other hand, have experienced much less positive selection since the populations diverged. This means that polar bears have experienced stronger selection and have diverged from the ancestors more than brown bears have. This matches what the fossil evidence suggests. Basically, a population of brown bears ventured northward and, in response to the very different climate, evolved into polar bears. The ancestral population stayed pretty much the same and are the brown bears of today. Now it’s getting harder to excuse Behe’s exaggeration. Specifically, the authors found that only 7 of the 17 genes with the strongest signatures for positive selection are unequivocally predicted to possess at least one “damaging” mutation. Even Behe’s “about half” is just 41%, which means that the lower limit on Behe’s estimation is also wrong. It’s not 65-83%, it’s 41-83%. The range is so wide because computational predictions invariably involve uncertainty. 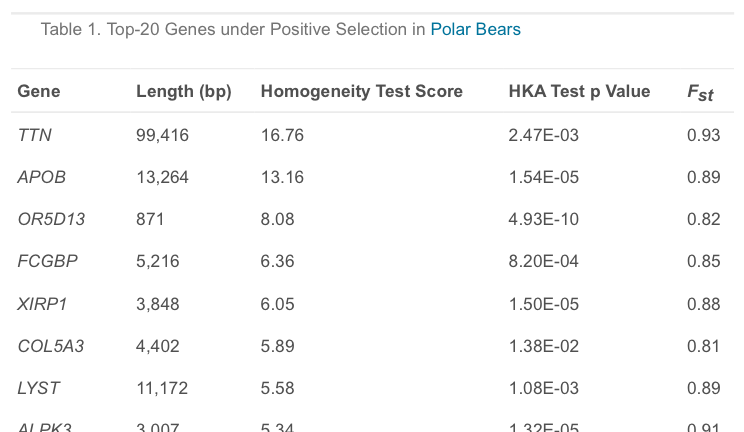 In other words, many of the 20 most positively selected genes in the polar bear genome are orthologs of genes that have variants (mutations) in the human population associated with metabolic disease. So when these genes are damaged by mutations in humans, the humans are more likely to suffer metabolic diseases. But Behe believes - with no hard evidence mind you! - that these same genes, when damaged, protect the polar bears from metabolic disease. Clearly, the authors do not expect the polar bear APOB to be “broken.” Rather, a bare majority of the amino acid changes are in the most important region for the clearing of cholesterol from the blood. In other words, these mutations likely enhance the function of apoB, at least when it comes to surviving on a diet high in saturated fats. To recap: 1.) There is no evidence for Behe’s claim that APOB is degraded or diminished in polar bears and everything we know about the protein from other mammals suggests the opposite. And 2.) Behe’s claim that the most common adaptive changes in polar bears are those that degrade or destroy proteins is not supported, and the evidence suggests otherwise. Those are just the errors that we found in his first example.